I would like to attract your attention to a common cast fake of a square Indo-Greek drachm of Apollodotos. The forgeries are presumably produced in Pakistan - a year or so ago I came across a couple of them at the eBay listings of a Pakistani seller. I informed the seller and he removed the listing. Earlier this week I came across several identical fakes listed by a very respected seller on eBay. I informed him, he thanked and removed one listing but listed three more again. It is even more strange that a die identical fake is present at zeno - http://www.zeno.ru/showphoto.php?photo=116417. Please be careful and attentive. Thanks for the warning and showing of these pieces. Thanks. I know how beautiful a real thing looks like. This coin has been my dream for the last couple of years, something that I could have consecrated my budget limitations for. Unfortunately fakes are abundant and real coins are scarce and expensive. I have recently seen a number of very good Mughal fakes or perhaps later but still in Mughal times struck coins. Once you understand the trick you can pick them as not "real" for the alleged time of striking. Note these coins I am talking about were struck in the normal manner. These also came from Pakistan. Dear Akona20, you mean contemporary fakes, produced in Mughal times? These might be very interesting for a numismatist and historian and very difficult to identify as fakes unless there are obvious differences in metals. Modern fakes however come in larger quantities and since we mentioned Pakistan we can also admit that there is perhaps a centre in this country producing high quality fakes (not the poor imitations common in South India, for example). Several years ago a big lot of very nice fake Sassanian coins came out of Pakistan and got distributed all over the world. I am afraid I have one of those in my collection. Now we have these drachms. 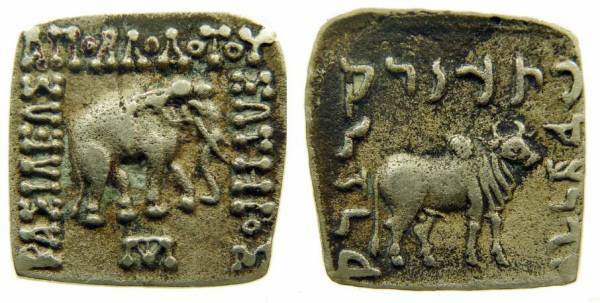 There are also doubtful Bactrian tetradrachms coming from Punjab but these might be an Indian product as well as Indian sellers have them too. The bad thing which I like the least about all that is that sellers often mix original coins with forgeries and keep selling fakes even when they are informed of the nature of the coins they sell maybe because of financial considerations. It becomes difficult to trust them after that. And for a collector with a modest budget purchasing a fake of some highly desired and expensive coin is very disappointing. Fakes have always been around since coin collecting started or should I say since anything of value was produced. I have somewhat fought against modern fakes for many years. For the fakers I am happy to announce that Ebay and like sites facilitate an easy way of selling these fakes. These sites absolutely refuse to do anything about controlling the problem. We now have fake coins, especially from the sub continent, actually being accepted as genuine by major auction houses and not so major certifying authorities. Nothing new because when groups of us stand up to fight very few really want to help. Better to complain than fight. A very interesting topic for collection. That requires a very solid knowledge of the period and of the types, dates, mints etc. of original coinage. How have you come to this topic? You collected original coins and then switched to contemporary counterfeits? In some of the books, maybe famous 'Coin Collecting in Northern India', I came across an idea that it was already A. Cunningham who became one of the first victims of Indian fake coin makers. As he purchased his most famous discoveries from Rawalpindi traders we might assume that Pakistan has to have a very solid history of producing fake coins. I can agree with you that my point in the topic of fake drachms is not very proactive but that is quite natural. Coin collecting is important for me but is not my main occupation. I am mostly concerned about fakes as long as these concern my own collection. In fact I am a very modest collector of Indian coins and the overwhelming majority of coins I have are quite common coppers which will hardly be ever counterfeited. My main motivation is interest for new information coming from coins which I believe is common for the majority of small collectors who do not 'invest' or 'pick the best specimen'. I could agree with your strict statement about eBay if there were any other comparative sources of coins for my collection. Most shops at numismall, vcoins etc. (I do not even consider auctions) are very expensive and the coins they offer are 2-5 times more expensive than the same coins offered at eBay. In my country there are no coin shows where I could find Indian coins (the topic is not popular in this part of the world). All that makes me a devout user of eBay. Sorry. I believe that any activities against fakes should focus on common fakes thus preventing collectors from purchasing them and informing of unfair sellers. Top quality highly expensive fakes produced for 'investors' and sold to them by highly respected auction houses are a problem, I agree, but these are almost impossible to fight with except for through legal means. Try this auction house. They have a different attitude towards fakes. Maybe not perfect (who is?) but they are doing something about it.